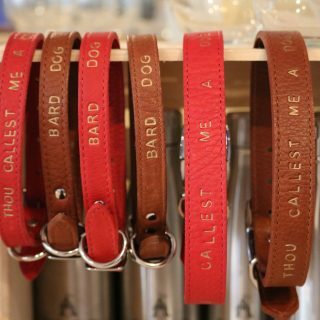 The Bard Boutique provides a large and fascinating selection of Shakespeare-themed items for every age and taste. Over 300 pieces to be exact! We asked Bella, our Boutique Manager, to weigh in with her favourite products and must-haves of the season. Read on for her Top 5. This is a very cute t-shirt. 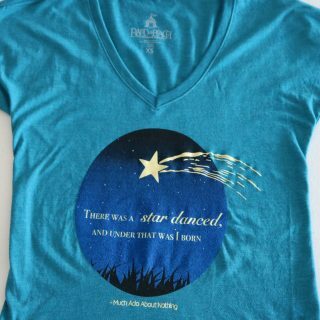 One of our most popular, it carries a quote from one of our plays this season, Much Ado About Nothing. I received the nicest email the other day from a patron who loved how soft it was and how it fit her – she wanted to know who supplies our shirts so she can find more! We had way too much fun figuring out names for these candles. Our final candle scents? “Speak low if you speak Lav” (Much Ado About Nothing/Lavender); Two Gentlemen of Vanilla (The Two Gentlemen of Verona/Vanilla); Eucalyptus, pursued by a Bear (The Winter’s Tale/Eucalyptus); and The Merchant of Lemongrass (hey, it’s really hard to come up with puns for lemongrass!) 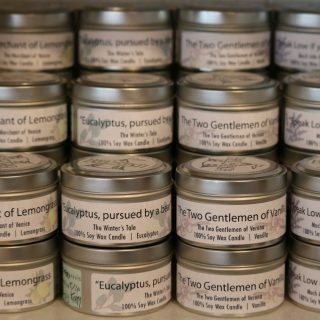 They come in cute little tins, smell amazing, and make a pretty good gift too. And each candle purchase supports the training and employment of the young adults of PALS Autism Society, as they carefully craft each candle! I love to cook, I love to bake, but most of all, I love to mix a delicious drink. 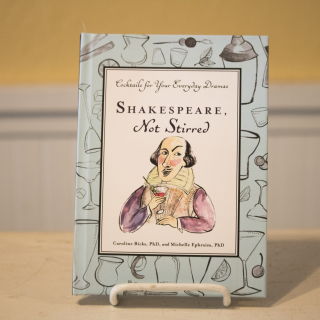 This book is pretty helpful in accomplishing all of that – with a Shakespearian twist. (And perhaps some skull shot glasses offer a fun twist, if you’re feeling the need for an “alas, poor Yorick” kind of party?) I actually gave this book – along with some wine glasses and a beautiful bar set – to some good friends of mine as a wedding gift. It was a hit! This might just be my favourite thing in the Boutique. We carry some phenomenal books, it’s true (check out “Women of Will” by Tina Packer! ), we have some beautiful clothing, and quite a few pieces of odd, eccentric and delightful Shakespeare paraphernalia – but oh, this mug! 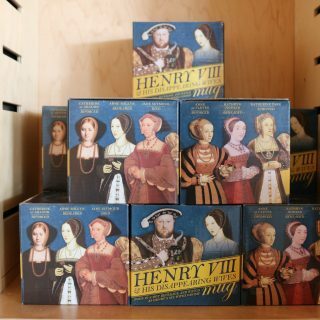 I don’t think I’ve worked a single day at the Boutique without telling someone “see, it has a lovely image of King Henry and his many unlucky wives pictured on it, but when you pour in hot water, his wives disappear.” Macabre and more than a little heavy? Yes. Hilarious? Well, come take a look and you tell me! The Bard Boutique is open one hour before each performance and at intermission. Come to the Village early to browse Bella’s favourites and choose your own!